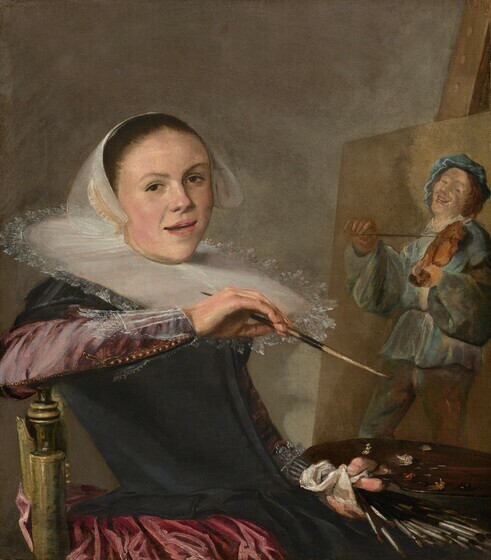 The pioneering Dutch artist Judith Leyster was born in Haarlem on July 28, 1609. At a time when there were few professional women artists in Europe, Leyster asserted her independence by joining the Haarlem painters’ Guild of Saint Luke in 1633, setting up her own workshop, and taking on students. She specialized in portraits and scenes of daily life, a modern genre that included depictions of musicians and merrymakers. Leyster likely learned to paint with her characteristic immediacy and spontaneity from the great Haarlem artist Frans Hals (c. 1582/1583-1666). She often used dramatic effects of light and dark to enhance the emotional character of her images, a stylistic innovation that set her apart from her contemporaries in Haarlem. Leyster’s career flourished for about a decade, from the late 1620s to the lat 1630s; she was described by a local commentator as a “leading star” – a pun on her name which means lodestar or comet. Following her marriage to fellow Haarlem artist Jan Miense Molenaer (1610-1668) in 1636, Leyster painted less and less, devoting her time to raising a family and running her husband’s business, which consisted primarily of painting and dealing art. Upon her death in 1660 Leyster’s name was largely forgotten, and her works were attributed to other artists. Since her rediscovery in the 1890s, scholars have been able to reattribute both signed and unsigned paintings to her hand. Leyster sits before a work in progress with the tools of her trade in hand, including 18 brushes. Yet she also shows herself as a dignified member of society, dressed in finery that would have been impractical to wear while painting. Technical studies indicate the Leyster originally depicted herself painting a portrait of a woman on her canvas (perhaps herself). She replaced the image with a fiddler taken from Merry Company, demonstrating her proficiency as a portraitist and as a genre painter. The serenader’s lively pose and the quick strokes that Leyster used to render him are reminiscent of the work of Frans Hals, with whom she likely studied. Many of Leyster’s earliest paintings are dramatically lit nighttime scenes such as this. The singer plays a lute, one of the most popular instruments of the 17th century. A popular pastime, tric-trac (as backgammon was known at the time) was also a form of gambling, which–like drinking and smoking–was associated with the vice of idleness. Here the woman holds a glass of wine in one hand and offers a pipe to her opponent, who looks out at the viewer with a knowing smile that suggests the two are also playing another, bawdier game. Merry companies–scenes of mirth featuring drink and laughter, often with music and dancing–developed in Haarlem in the early 1600s and remained popular throughout the century. Although paintings of joyful gatherings sometimes conveyed moralizing lessons about the consequences of unrestrained revelry, the convivial atmosphere of this happy group seems undisturbed by such concerns. A man, almost certainly with illicit intentions in mind, offers a handful of money to a woman intent on her sewing. In Dutch painting, scenes of propositions often portray women as willing accomplices or temptresses who ply their suitors with wine and tobacco. Here, the woman is cast instead as an unwilling participant: dressed modestly, she leans over her work, refusing to acknowledge the man’s advances. Engrossed in his music, the flute player tilts his face upward, catching the daylight that streams in from the left. Leyster skillfully rendered the play of light in the room as it bathes the young musician and his instruments in an atmospheric glow, casting shadows along the wall. Leyster and her husband, the artist Jan Miense Molenaer, owned several musical instruments, expensive objects that they likely used as props for their paintings. People making music with one another was a common 17th century metaphor for love and harmony between couples, family, and friends. Intimate gatherings of singers and musicians became a popular genre subject. The woman taking part in this lively recital may be Leyster herself.